This pork chop marinade has a strong and bold flavor that will take your meal from flat to distinctive. Use this quick and easy marinade for grilled or baked pork chops that are surprisingly sweet. Note: This post was updated on August 8, 2018 with new content for your enjoyment. 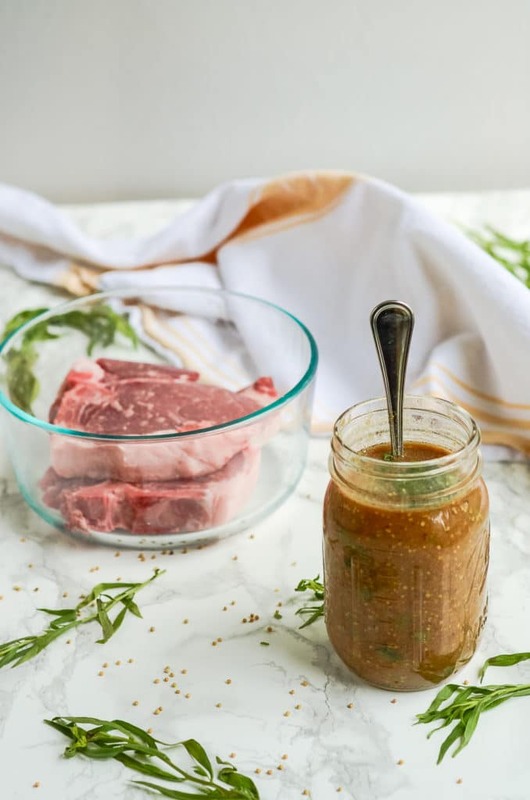 This pork chop marinade is perfect if you always seem to have a large of assortment of condiments on hand. However, don’t let the ingredient list scare you off. The flavor from this marinade is well worth it! Each type of mustard has been paired with its perfect vinegar mate to make the best pork chop marinade around. Want to get the most out of this pork chop marinade? These cooking tips will help you master this recipe and make the best grilled or baked pork chops out there! How To Make A Vinaigrette. This explains the process of getting the oil in the marinade to become thick and combined. Buying & Storing Fresh Herbs. Sometimes it’s hard to tell how fresh the grocery store herbs are. It can be even trickier to keep them fresh once they’re home. Find out how. All About Marinating. 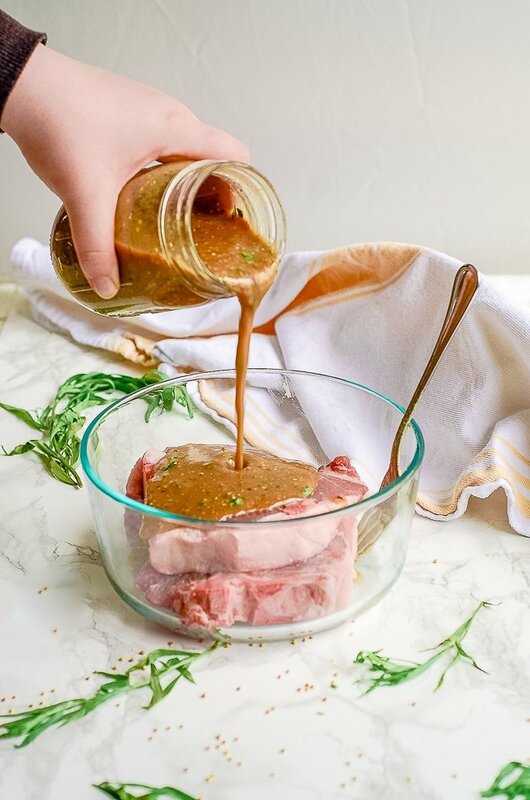 This details everything you need to know about DIY marinating. How To Get Rid Of Kitchen Grease. Did you know that marinades shouldn’t go down the drain? Find out why and the best way to get rid of your excess pork chop marinade. How Long Is My Pork Chop Marinade Good For? Since this pork chop marinade is made of primarily shelf-stable ingredients, the only hangup is the fresh herbs. As a result, this marinade can keep in the refrigerator completely made for about one week. If you would like to keep a larger batch of it, you can just omit the herbs. Then you can just add them in when you’re ready to use the marinade. 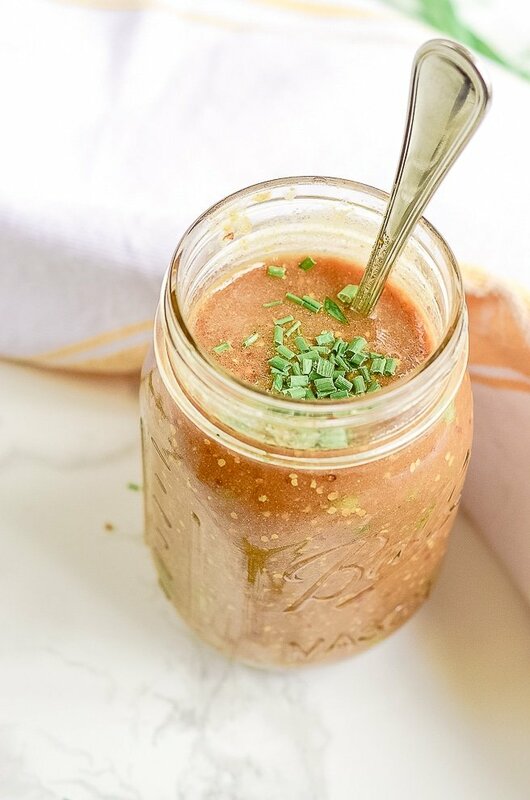 Without the herbs, this marinade can last in the fridge up to a month! There may be some separation during storage, but a quick whisking with a fork will recombine it. 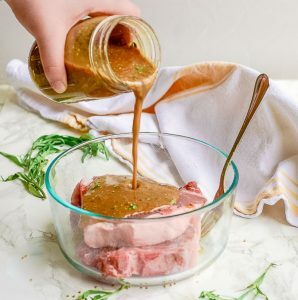 If you decide to freeze this marinade, it will keep frozen for up to 6 months. As with any marinade, please discard the unused leftovers once you are done marinating. Since it has come into contact with other foods, you don’t want to risk food-borne illnesses. Stay safe. Figuring out how long to marinate your pork chops is mostly about your goal. If you only want to add flavor, they just need a brief period of time; usually, one to two hours. If you are trying to tenderize your pork chops however, they can be marinated up to overnight. They type of pork chops you choose can also impact how long to marinate. It doesn’t really matter whether you choose bone-in or boneless chops, but the size of them does. The thicker the chops are, the more time you’ll want to give them to tenderize or absorb flavor. The important thing to say up front is that you shouldn’t use a marinade when frying. This is a great recipe for baked pork chops, however. The vinegars add a surprisingly sweet flavor profile that makes it a crowd pleaser. Even small kids enjoy the flavor of it, which makes it a fantastic marinade for quick and easy dinners or back to school meals. This also tends to be a fan favorite for grilling because the flame changes the flavors of the sugars in the marinade for a “manlier” flavor profile. I’m going to let you in on a secret. This Marinade of Many Mustards doubles as a vinaigrette. If you decide to use it that way, it works especially well on bitter greens like chard, kale, or collards. Want a free printable grocery list for this pork chop marinade recipe? Get it HERE. Below you’ll find other tasty recipes from our month of marinades. Whether you are making grilled pork chops, or have some loin chops to bake in the oven, this marinade is quick way to add flavor. In a bowl, whisk together all of the ingredients except the oil and herbs. Adding only 2-3 Tablespoons at a time, whisk in the oil vigorously until it is completely combined. Stir in the chives and tarragon. In a ziplock bag or the smallest container necessary, pour the marinade over the pork chops until they are completely submerged. Marinate up to 24 hours and bake or grill until the internal temperature of your pork chops is 145°F. Don't have hot mustard on hand? Two packets from Chinese take out will work! I happen to love mustard and marinades. I can envision myself using this in many ways, even on baked potatoes. Yum! Ooh! I hadn’t even thought about that, Christine! I love that idea! Wow, this looks like one powerful marinade! Looks like you’ve got some great tips there too. This marinade sounds perfect! I could see many uses for it. I feel like I’m only just beginning to tap into the options for what this could go with, Suzy. It’s very versatile! Then it’s tailor-made for you, Jo! I hope you love it! I bet these would really taste good on lamb! Thanks for the great idea. I find that it quickly overpowers the delicate flavor of lamb, but I bet it would work beautiful as a warmed serving sauce! This is such a great idea! I bet homemade is so much better than store bought too! Pinned to make VERY soon! I love mustard and my wife and I sometimes disagree as to which mustard is the best with a particular dish. But I see with this marinade you have solved our problem. Love the concept of the many mustards. My hubby LOVES mustard. I’ll save this for when spring comes and my tarragon comes back in. Thanks! Yes! I hope it’s a big hit! Wow!!! I totally want to try this!!! I love all the different mustards and vinegars in there! I bet there is SOOO much flavor! It is a super flavorful marinade, but the flavor is very “masculine”. It smells sweet when you make it, but doesn’t taste sweet at all. Mmm this sounds tasty! I personally love mustard – my favourite is wholegrain! I’m with you there. Whole grain is the best. I love the texture from it! Nothing like having plenty of options in your kitchen for tasty meals. I love having marinades and sauces on hand for cooking. So much flexibility. Me too, Mark! When I make marinades I always try to double or triple the recipe so I can freeze it for later. It’s nice to be able to just pull it out of the freezer the night before and have it ready in the morning! This looks like it would go with so many things–and not only as a marinade! You’re definitely right, Carol. It makes for an excellent vinaigrette as well! I love that you’re growing tarragon! It’s such an underutilized herb and one of the things that makes this such a great recipe (in my opinion). Yes! I love how well this works for both grilled pork chops as well as baked pork chops! We love finding new marinades because we grill all the time. Can’t wait to try it! Yes! I look forward to grilling season every year! I hope you love it! I love the look of this marinade. Have you tried it with other meats at all? Yes, I have. The flavors work really well with pork, but I’ve also had excellent success with chicken and beef. It’s a bit overpowering for seafood and veggies, though.